If you are remodeling your Houghton Lake kitchen or bathroom, you should strive to maximize the benefits of the project by purchasing materials from knowledgeable experts. One of the most confusing aspects of any remodeling project is determining what type of cabinet to install in your home. Cabinets come in such a wide variety of wood species that it can be difficult to know where to start. At Kabinetree Koncepts, their cabinet design experts can help guide you to the best choice in kitchen or bathroom cabinets. They have a wide selection of cabinet materials in their show room. They have provided the following basic guide to some popular wood species to help you start. Come by their showroom to see countless samples and receive expert advice. Maple wood cabinets are extremely popular in part because of their creamy white color and luxurious smooth texture. Maple cabinets vary from light brown to off white. Oftentimes, maple has a truly individual look because the tree developed mineral streaks as it absorbed materials during its growth. Because maple is extremely smooth, it is a great option for staining and painting. Another popular option among Houghton Lake residents is cherry cabinets. Cherry cabinets also display a strikingly uniform grain pattern. The color ranges from light red brown to a medium intensity with intermittent white cream. A unique feature of cherry cabinets is that they often become more enriched with age and sunlight exposure. For Houghton Lake residents that are looking for either a casual or rustic look, they should consider installing knotty alder cabinets in their kitchen or bathroom. The distinctive feature of these cabinets will be the natural knots in the wood that vary from tight to open. The color variations are very similar to the reddish brown hue of cherry. In contrast to cherry, knotty alder actually brightens with age. In recent years, lyptus cabinets have become very popular amongst Houghton Lake homeowners. In appearance, lyptus is very similar to mahogany in its rich red color and grain texture. In addition, lyptus is a sustainable wood species that is a great environmentally friendly option because they grow to maturity within 15 years. Red Oak cabinets will have the most distinctive and prominent grain patterns. These patterns are characterized by their wide arches and tight straight lines. Red oak varies in color from its namesake reddish hews to light brown and creamy white. Occasionally, red oak develops mineral streaks and pin knots for a truly unique look. 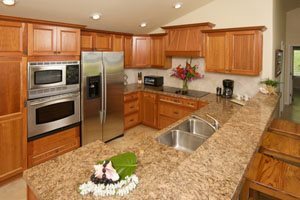 If you need to hire a kitchen design team or to purchase high quality plumbing, cabinet, flooring, or countertop materials in Houghton Lake, call Kabinetree Koncepts at 989-422-3545, or complete our online request form.